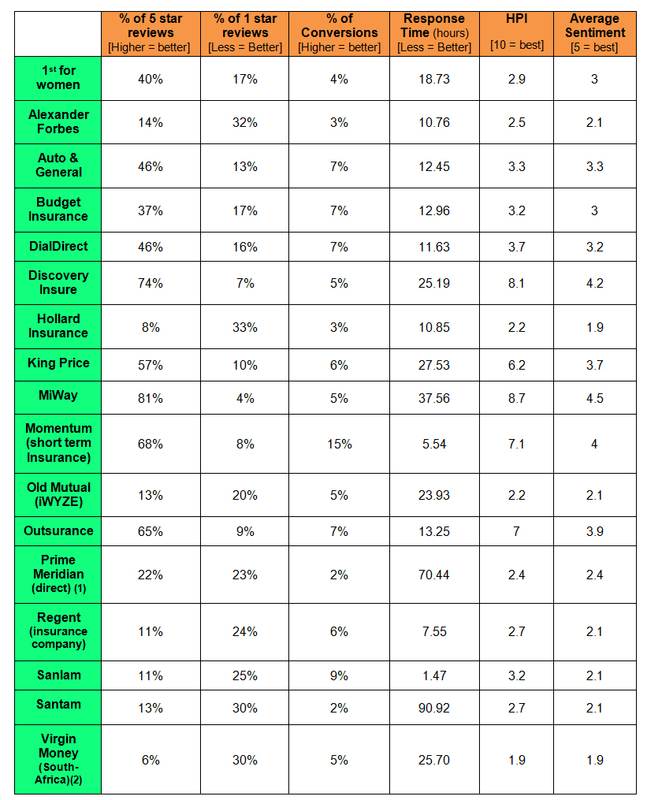 For the last three years, Carinfo.co.za has conducted a comparison analysis between the more known car insurance companies in South Africa, in an attempt to find out which one is best (previous years: Best Car Insurance Company in SA for 2013, Best Car Insurance Company in SA for 2014 and the Best Car Insurance Company in SA for 2015). Prior to our 2013 analysis, such research had never been done, and we got a huge positive response from the public. Since then, it has become a tradition as a service to the public and our readers. So, here we go. Let’s find out which car insurance company ranks best for 2016. 1. A word to the critics. 2. How we did the research. 1. Our review is NOT scientific and is only intended to give potential consumers a general indication of the quality of a company's level of service. 2. Yes, if you change certain factors (such as our point system) you will probably get slightly different results just as with any experiment/research (See point #1). Our method was based on common logic and the attempt to keep things simple. 3. Yes, we know that some people might have had good service with a low ranking company, whilst others might have experience bad service with a high ranking one (see point #1). 4. 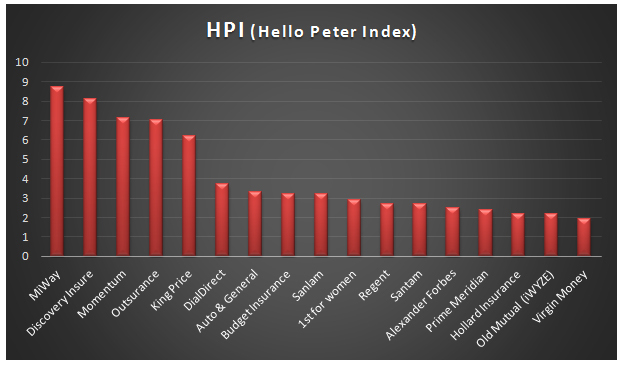 Some of data from HelloPeter (“HP”) was specific to the company’s short-term insurance (like car insurance), in other cases the data applied to the company as a whole (and includes various insurance products). Nevertheless, we believe that a company’s overall ranking does give a good indication to the service provided in the individual departments. 5. We are always open to suggestions on how to improve, so feel free to comment here below (and No, writing: "this report is BS" isn't a comment of any real value). 6. Disclaimer: although some insurance companies may currently, or have in the past, advertised on our website, none have attempted to influence this report, and we do not endorse any specific company. 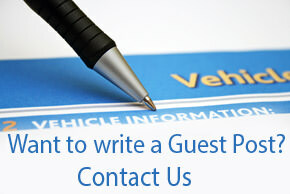 We advise all consumers to get at least 2 quotes before signing with a specific insurance company. 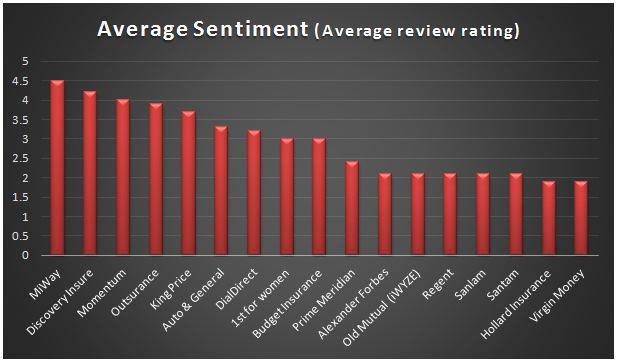 We selected 17* of the more known car insurance companies in South Africa, and analyzed their level of performance based on 6 categories from the Hellopeter** website. We then used a point system to analyze which companies performed best, giving 5 points to the best performing company in each category, then 4 points to the second best performing company and so on. We then added all the points to discover who had the best overall score. It is important to note that in order to make sure that a specific point system wasn’t affecting the results, we tested our results by using a 10 point system as well, and found very slight variations (see more on this point at the end of the article). 1. Percentage (not amount) of 5 star reviews (the most positive review). 2. Percentage of 1 star reviews (the least positive review). 3. 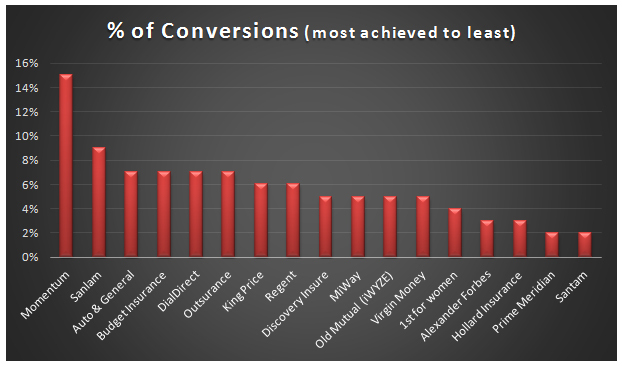 Percentage of conversions (the percentage of complaints changed to positive responses). 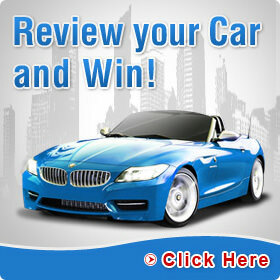 * We selected companies that had at least 150 reviews on Hellopeter. This was done due to 2 reasons: (1) less than 150 reviews reflected on the accuracy of the data and (2) we found it unjust/strange that some companies (which on the previous version of Hellopeter had hundreds of reviews), now only had a small amount (although this might be due to the change of the HP platform, we wanted to keep the comparison as fair as possible. ** Hellopeter is an independent website on which customers can review the service they received from a company and receive responses from company representatives. This report was based on data on Hellopeter, from the past 12 months (approx. January 2016 to December 2016). The data is changed/updated on a daily basis – so data collected at a later date, may slightly differ. *** Hellopeter’s industry standard barometer for measuring the health of an organization’s customer service, based on a wide range of factors. We were curious to see if we’d get a different result by breaking down the various criteria. 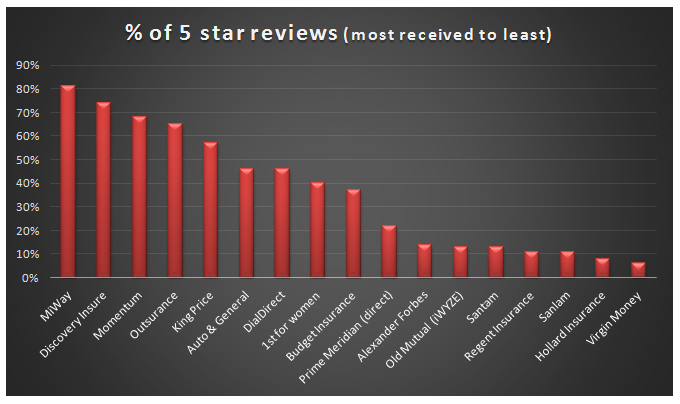 **** The average star rating given by customers/reviewers. (1) A company named “Prime Meridian Enterprises” appears on the Hello Peter website, but it has very few reviews. 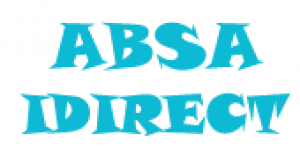 Additionally, the Prime Meridian website shows the car insurance services under “Prime Meridian Direct” and therefore the statistics were taken from this company name. (2) A company named “virgin Insurance” appears on the Hello Peter website, but it has very few reviews. Additionally, the Virgin Money website shows the car insurance services under “Virgin Money” and therefore the statistics were taken from this company name. 5 Star reviews = good reviews. Companies to the left = lots of good reviews. Companies to the right = smaller amount of good reviews. More to the left = less negative reviews. More to the right = more negative reviews. % of conversions = the number of complaints that changed to positive responses. More to the left = managed to satisfy more customers who initially complained. More to the right = less success in satisfying disgruntled customers. More to the left = faster response time. 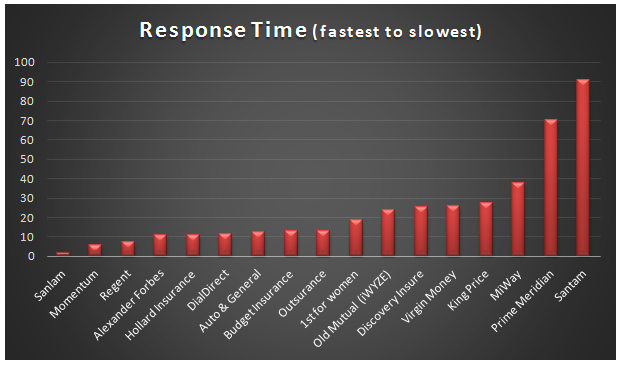 More to the right = slower response time (if any). HPI is Hello Peter’s industry standard barometer for measuring the health of an organization’s customer service based on a wide range of factors. 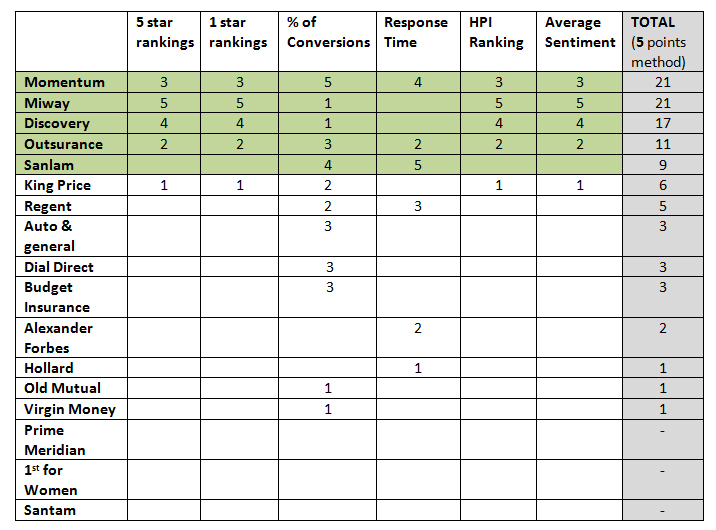 The higher the ranking the better the overall customer service (5 being the highest). More to the left = better customer service. More to the right = lower quality of customer service. 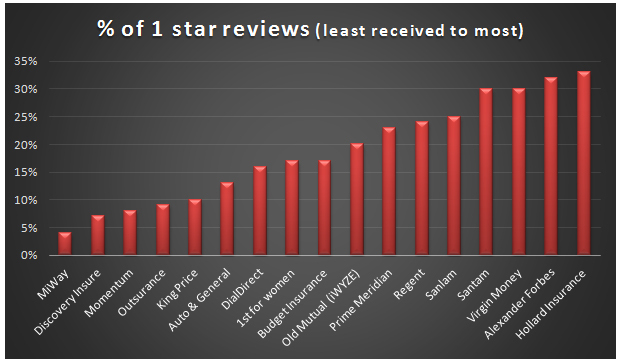 The average star rating given by customers/reviewers (5 being the highest/best). More to the left = better overall customer service. More to the right = lower quality of customer service. ‘Show me the Money’ (I mean the results)! 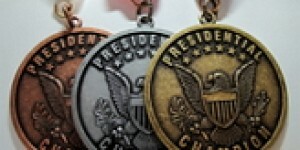 Remember, in order to rank the companies we used a point system, allocating 5 points to the best performing company in each category, 4 to the second best and so on, and then added all the points to determine who ranked best. In order to make sure that a specific point system wasn’t affecting the results, we also tested the results based on a 10 point system. The results were very similar, with slight differences. These were the top 6 ranking companies based on the 10 point system: Momentum, Miway, Discovery, Outsurance, King Price and Auto & General. As you can see, all of the 3 top companies remain at the top. * In previous years we divided the companies in to 2 groups; “large” companies and “small” companies. Due to a change in the way the information is presented on Hellopeter, we did not use this method this year. Explanation: In the below table, the first column contains all the companies reviewed. Next to it are the 6 categories reviewed. Under each category, we added the amount of points that each company received (5 being the best/most and 0/- being the least) based on their rankings in each category (see above graphs). 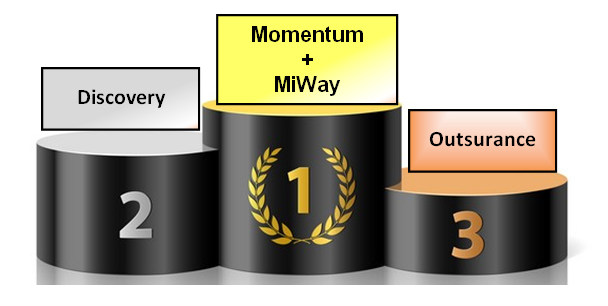 For example, under the "5 star rankings" column, Miway received 5 points because they were first in the category. We then added all the points received by each company to determine the top 3 best performing companies. 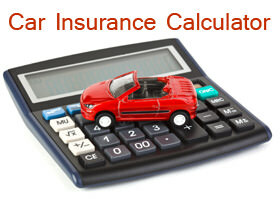 Drive Safe (and with insurance)! 1. All rights to this article (including images and graphics) belong to carinfo.co.za. You may not copy this article, or major portions of it, without our prior written consent. Nevertheless, we do like to share for the public good! So, feel free to quote and/or mention information from this article, so long as you add a link back to the original article. We would appreciate it if you did not mention the 1st place, so that the readers will have a reason to click to the full article. 2. We do not represent any of the companies, services or products mentioned or published on this website. We are not a financial services provider or an insurance provider. Any decisions you make based on the information presented is at your own discretion. We advise that before making any legal, financial and/or medical decision you consult with the relevant professional. 3. As mentioned, we do not proclaim that the above research is scientific and/or 100% accurate. Nevertheless, we are confident that it can serve as a good indication as to the quality of service that the various car insurance companies provide and allows the consumer to make a better informed decision. As always, we advise all our readers to get car insurance , to read up on the subject before, and to get at least 2 quotes.